Bruggers RL, Elliott CCH (eds). 1989. Quelea quelea: Africa's bird pest. Oxford University Press, Oxford. 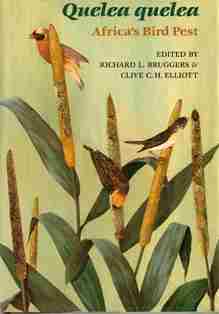 The Red-billed Quelea is a major avian pest in sub-Saharan Africa, and this book is the classic text on the species. It summarises the biology and pest status of the quelea, and contains several colour plates of photos. 1 De Grazio, JW. Pest birds - an international perspective. 2 Jackson, JJ & Allan, RG. Historical overview of quelea research and control. 3 Elliott, CCH. The pest status of the quelea. 4 Elliott, CCH & Lenton, GM. Monitoring the quelea. 5 Johns, BE, Bruggers, RL & Jaeger, MM. Mass-marking quelea with fluorescent pigment particles. 6 Bruggers, RL. Uses of radio-telemetry in quelea management. 7 Keith, JO, Okuno, I & Bruggers, RL. Identifying quelea populations by trace element analysis of feathers. 8 Otis, DL. Damage assessments - estimation methods and sampling design. 9 Jones, PJ. General aspects of quelea migration. 10 Jaeger, MM, Elliott, CCH, Bruggers, RL & Distribution, populations, and migration patterns of quelea in eastern Africa. Allan, RG. 11 Jones, PJ. Distribution, populations, and migration patterns of quelea in southern Africa. 12 Manikowski, S, Bortoli, L & Nâ€™diaye, A. Distribution, populations, and migration patterns of quelea in western Africa. 13 Jones, PJ. Factors determining the breeding season and clutch size. 14 Jaeger, MM, Bruggers, RL & Erikson, WA. Formation, sizes and groupings of quelea nesting colonies. 15 Jones, PJ. Quelea population dynamics. 16 Thiollay, J-M. Natural predation on quelea. 17 Erickson, WA. Feeding ecology of quelea. 18 Bashir, EA. Traditional African practices for preventing bird damage. 19 Bruggers, RL. Assessment of bird-repellent chemicals in Africa. 20 Bullard, RW & Gebrekidan, B. Agronomic techniques to reduce quelea damage to cereals. 21 Meinzingen, WW, Bashir, EA, Parker, JD, Lethal control of quelea. Heckel, J-U & Elliott, CCH. 22 Elliott, CCH & Allan, RG. Quelea control strategies in practice. 23 Jaeger, ME & Elliott, CCH. Quelea as a resource. 24 N'diaye, A, Bashir, EA & Jackson, WB. Training and extension in quelea management and research. 25 Elliott, CCH & Bruggers, RL. Conclusions and future perspectives.